blog.dinogane.com: The Return of Brand Integrated TV Shows? The Return of Brand Integrated TV Shows? 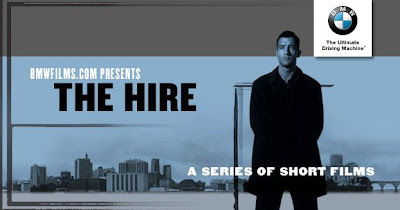 BMW's mini-series stars Clive Owen and is directed by star directors, such as Guy Ritchie. (c). I previously discussed how television networks act as a three way match-making platform for audiences, content makers and advertisers. It was not always this way. In the distant past, advertisers heavily influenced the shows made for television. The medium was more akin to a two-way platform between advertisers and audiences: advertisers made shows for audiences interested in tuning in. This changed in the 1950s. With technologies such as TiVO and on-demand TV scuppering commercial breaks, are we now set to return to a world of advertiser made shows? In the 1930s and 1940s, the early years of television and radio, broadcasting acted more instinctively as a two way match making platform between advertisers and audiences. Advertisers strongly influenced and shaped content broadcast to the audience. This is evident in the naming of show titles, which included the Ford Star Jubilee and General Electric Theater. The influence of advertisers was such that, one story even suggests that the president of the American Tobacco Company made high ranking NBC executives fox-trot to the tunes of a show that the American Tobacco Company was sponsoring. The American Tobacco Company head wanted the NBC executives to test the tempos of the songs for dance-ability. In the late 1940s, William Paley's CBS started experimenting with making shows in-house. The experiment proved successful, as CBS in-house shows started gaining larger audiences than that of shows broadcast by NBC. Everything changed when Pat Weaver, president of NBC in the early 1950s, broke the ties that advertisers had with the content that was broadcast. Instead of advertisers sponsoring a show and working with an advertising agency to make it, the networks made the shows themselves. The focus of the advertising agency moved to making 30-second commercials for the breaks in the shows. Later, rather than making the shows in house, the networks outsourced production of the shows to studios and production companies. This is what now leaves us with the three party platform of content makers, advertisers and audiences that network TV now is. These films, distributed on the internet, have been so successful - they have inspired similar efforts by Pirelli and Mercedes. In the meanwhile, Fox has started dedicating TV slots for infomercials, which they hope in future will become as entertaining as regular TV. NBC had already started creating shows for displaying in show advertisements - though these shows will only be broadcast online. In the case of the show Mall Cop, TV producers have advertised Segway PTs not for gaining profit - but out of their own shear enthusiasm for the product. Will this transformation in advertising create moral ambiguity? Certainly. Advertisers and content makers will need to grapple with how brand sponsored content can be made ethically. Will this mean that quality TV programming will deteriorate? I think not. In the late 1980s and early 1990s, MTV pioneered the concept of the music video: the consumer tunes in for the advertising message. Investment in music videos increased, production quality of the content form sky rocketed and the music industry was forever changed. No one minds that it is advertising. What needs to happen for this to happen to regular TV shows?